Urban Zombies are your base foes, though they actually don’t show up that often in the streets. They have fairly standard physical attacks, and die more easily against PSI Fire. Zombie Dogs are slightly more vicious and a bit faster than plain ‘ol Zombies, but are otherwise pretty similar. Watch out for their bites. Handsome Toms are annoying if only because they can put your characters to sleep. Fry them with Fire or Freeze. Smilin’ Sams are pretty similar to Handsome Toms, and typically appear together in groups. They can cast Lifeup. Otherwise, not as annoying. Zombie Possessors can, as the name implies, possess your characters with ghosts. These little bastards will follow you after battles and occasionally freeze your characters when you get in subsequent fights. Blue-haired healers can get rid of ‘em. 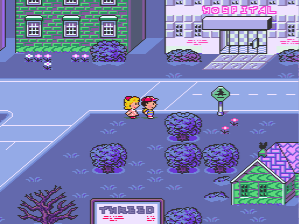 Like most enemies in Threed, Zombie Possessors are best destroyed with PSI attacks, namely Paula’s PSI Freeze line. Stinky Ghosts are almost invulnerable to physical attacks. Use PSI or flee. Putrid Moldymen are better handled with physical attacks, and can make your party members cry if given a chance. Try to kill them first to avoid this annoying status ailment. Trick or Trick Kids are strictly physical creatures. Not much to say, and you won’t see ‘em often anyway. No Good Flies are pretty weak, typically appearing in groups. PSI Fire will take ‘em out with little fanfare. - We’ll start with the west side of Threed’s southern street and make our way east. First to the Drugstore, where you can purchase new equipment for your doodz. The trash can out front has nothing inside. - Down the street is a Hospital. Inside is the standard assortment of healing services. Check the first room on the second floor and, in the dresser, you’ll find an Insignificant Item. Return this to its owner, a man in one of the rooms in Twoson’s Hospital, and he’ll give you a Truffle. Noice. The remainder of the street is rather useless, though you can find a Skip Sandwich in a trash can near one of the houses. - The fair grounds south of Threed are teeming with enemies and no use for anything besides levelling right now, so head north and wander back west, pausing just a moment to check the home in the northwest of Threed. The Hint Man lives here, and there’s a Teddy Bear in the trash can out front of his home. - Head west past one of Threed’s two graveyards. The houses here are little use, though you can find a Hotel along the way, and in the middle of town you’ll find a Circus Tent. It’ll figure into the game later. 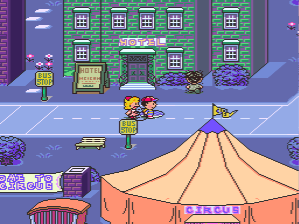 The only thing of potential use is the gun seller just south of the Tent, behind the Mach Pizza shop, and most of his stuff is not for Ness or Paula. - Head for the northwest graveyard in Threed after exploring the town as thoroughly as you please. You’ll find a trash can containing an Insecticide Spray on your way to the corner of the map. Eventually you’ll come to a pair of zombies who will not attack, but who won’t let you through, either. They seem a minor thing, but these zombies must react to you to trigger the next step of the game. - Return to Threed and check out the Hotel. A blonde woman is flaunting herself outside. 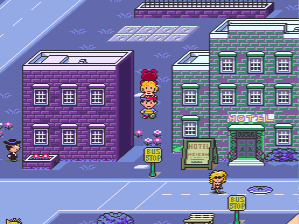 Follow her into the Hotel and, uh, you’ll get into a smidgen of trouble. 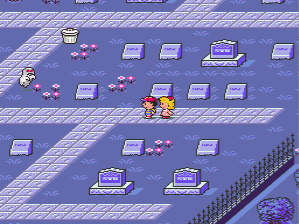 Ness and Paula will need more help to escape this pickle.